To make the dressing mix the crème fraiche with the wholegrain mustard, the juice of half the lime and the (optional) brown crabmeat. Boil a pan of salted water large enough for the asparagus spears and drop them in until just cooked, about two minutes. Drain them, pop them into iced water, drain and then cut the spears diagonally into two or three pieces and toss them through the dressing. 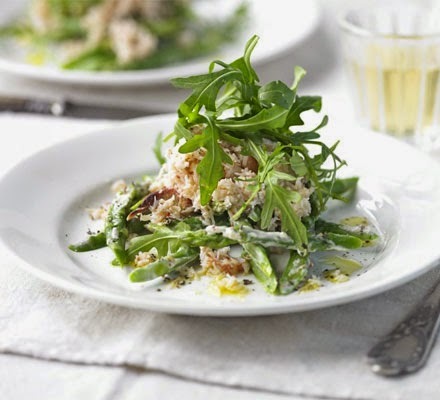 Place the asparagus on the plate like a nest, add the crab meat to the middle and garnish with pieces of rocket. Drizzle over some olive oil to taste and enjoy.